As someone who eats an abundance of pasta and noodles, I don’t mind saying how much I hate the widely accepted standard of cooking noodles “al dente.” Hear me out, I know every pasta recipe out there says “cook till al dente,” but I’m telling you, this is the worst way to cook pasta. It’s a terrible standard for noodle cookery and we should stop adhering to it. 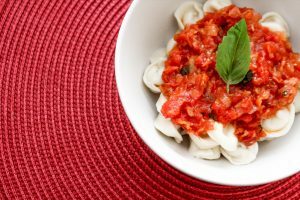 “Al dente” in Italian means “to the tooth.” In other words, it should be firm to the bite. However, I can’t imagine anything more unappetizing than biting into a hard, firm noodle. In my opinion, noodles should be soft and chewy. That way, they can absorb more of the flavour of the sauce and it also gives the pasta a nice, soft texture that is easier (and more enjoyable) to eat. Al dente, to me, means it isn’t fully cooked, and I don’t like to eat undercooked food, especially pasta. The thought is so unpleasant that it’s enough to make me never eat pasta again (almost). Many chefs or food blogs will say that you’re supposed to cook pasta until it’s cooked almost all the way through because it will keep cooking after it’s off the heat. However, in my experience this has never been the case. In the past, when I’ve cooked my noodles al dente and kept them on a heat source, even after serving they have still been too firm for my taste. Call me crazy, but I’ve made the decision to start cooking my noodles until they’re soft and almost soggy, and I haven’t looked back since. Some would call that overcooked; I call it dinner. I know everyone has their own standard when it comes to cooking noodles, but al dente really should not be the universal guideline. It may be a widely accepted principle for noodle-cooking, but you don’t have to follow it just because everyone else says to do it this way. Try cooking your pasta until it’s soft or fully cooked for a change and experience your true noodle potential.